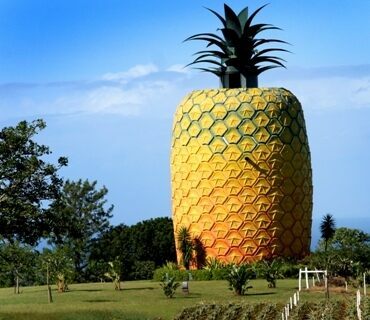 Standing just under 56 feet tall, the “Big Pineapple” outside of Bathurst, South Africa is the world’s largest pineapple building. The surrounding area is mostly agricultural land known for its pineapple production. Farmers who settled in the area in the 18th century struggled to successfully grow crops until they began planting pineapples. So, naturally, locals decided to honor the fruit and the sweet earnings it brought by erecting a massive building in its shape. 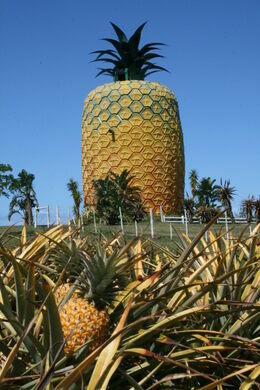 The Big Pineapple was constructed by members of Bathurst’s agricultural community in the 1980s. The building itself is three stories tall. It’s made of metal and fiberglass and features an observation platform. The inside of the pineapple contains a museum dedicated to the fruit with a variety of pineapple products available for sale. 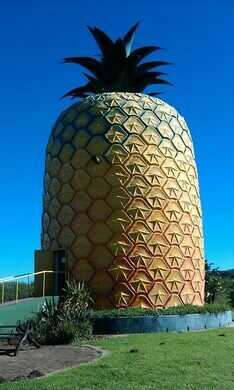 Though it’s a copycat of a similar fruity structure in Australia, the Big Pineapple is taller by just over two feet and thus claims the title of World’s Largest Pineapple. Just outside of Bathurst, Eastern Cape. Approximately 7.5 miles from Port Alfred. Just off R67. Open 9 a.m. to 5 p.m. daily. This odd little home was built right into an African rock face.